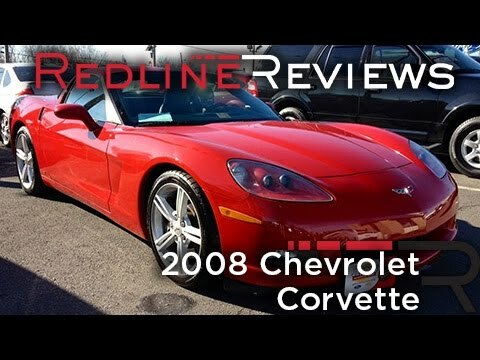 If you love your cars American and iconic, the 2008 Chevrolet Corvette is a sports car purist's dream come true. Drivers experience awesome V8 power, amazing handling and an interior filled with more creature comforts than some luxury cars. Reliable vehicle. I love this car! Very reliable vehicle. The inside is really nice and comfortable seats. Love this car! I haven't really had many problems with this vehicle. I have had the tires changed, oil changed, put new led headlights on it. The driver, passenger and backs seats are very comfortable. I live in a town with a couple bumpy roads so everybody knows how that can go. It is a sports car that is very comfortable and reliable and a good daily driver. Well the performance handling the looks the options rides great gets good gas mileage everything works some wonderful car I have never had any problems with the car everything works heads up display stereo is awesome seats are comfortable visibility is great. That it's my favorite vehicle. I love the space of my vehicle. It's a very nice riding vehicle. I don't like that it's a lot going wrong with it.